The whole group - with a bit of waiting up and re-arranging - heads to the edge of the jungle and moves inside. It's going to be pretty tough going. You can only get about 6 miles for an 8 hour day in the jungle - that's only one hex. The nearby desert would be 2 hexes a day. 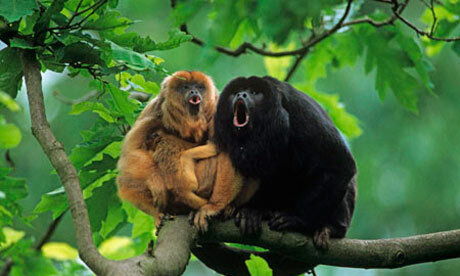 You see lots of animals in the jungle, and monkeys throw things at you from the trees and scream at you. Sonja sees no more evidence of large tracks, however. There's also no sign of human trails or the like. "Maju, where are the mountains your falcon was talking about ? If we ca reach it and climb it, we would have a very nice view of the surroudings. There is to have a village, and a tavern, somewhere not too farm no ?" mTeasdale wrote: "Maju, where are the mountains your falcon was talking about ? If we ca reach it and climb it, we would have a very nice view of the surroudings. There is to have a village, and a tavern, somewhere not too farm no ?" "She says the mountains are at least a day away, inland I assume. Also, there are a lot of streams and rivers. That's good for water, and for our sea-elf here. But it also may make for some slow going. She also saw out in the desert. There are large lizards out there; a herd of them." Maju looked around at the others and said, "Does anyone have a plan here?" As Maju says, the mountains are to the south. You can see them too in the distance - just not as well as the falcon. It'd take you about a day and a half to walk to the base and another day to scale one. But as you say, you'd get a great view, so it may be worth it. Yuan-Cheng seems upset at not finding signs of humanity. "We will need water. Let us go to the mountain." "I think we will feel safer on the top of a mountain than on a beach infested with giants lizards." Jaali then looks at the rest of the party. "I'll pay the first round if we find a damn tavern. And the second, too." And what of our pirate friend? Is he following us deeper into the jungle? Yes. I still haven't worked out if that pirate is Saracen. I'll give him a day or so to respond and then decide that it is. In any case, he's in the rear and not really bothering to stay hidden. There is only so many ways to go through this jungle. Saracen, managing to swagger even when moving quickly, sprints until he catches up with the others. By the way, the names Saracen and the eagles called altair, I realise we may have got off to a bad start, what with me and my friends boarding your ship and whatnot but we're all in the same boat now He smirks both figuratively and literally. Maju regards Saracen suspiciously and says, "So if you're a pirate, can you tell us what are the odds they'll get the ship seaworthy again? If we go traipsing into this jungle, I don't want to return to find that they've fixed the ship and marooned us here."